Team of Arkeologi Nasional Jakarta (Jakarta National Archaeological) led by Prof. Harry Truman Simanjuntak will conduct research and DNA testing millennia-old human skeletons that found in Gua Harimau (Tiger Cave), in Padang Bindu Village, Ogan Komering Ulu (OKU) regency, South Sumatra, Indonesia. According to Wuryantari, a researcher from the Eijkman Molecular Biology Institute (Lembaga Biologi Molekuler Eijkman) as confirmed on the sidelines of the research in Gua Harimau, Baturaja on Monday, May 26, 2014 saying that DNA tests conducted aiming to identify the status of the relationship of human skeleton was found with today's modern society. "We want to reveal whether it still has a human skeleton in genetically close kinship with the indigenous tribe in Ogan Komering Ulu," she said. She explained Similarly, DNA tests were conducted, among others, to examine the leg bones of the skeleton and take teeth sample. "The bones are actually nice to be sampled, but the conditions must be compact in the sense of a thick layer of bone is not brittle and the best are the teeth," she said. She argues, that studied only four individuals of 78 skeletons have been found, ie the skull of the E11 sector, Individuals 54, 48 and 49 because it is most excellent to be tested. "Later we will bring to Jakarta to analyze the possibility of civilization," said Wuryantari. According to her, the research done already digging in Gua Harimau to a depth of more than four meters in order to look for other human skeletons. The results, while the two skeletons are buried and find the tools and human combustion performed earlier times. "Excavation of two meters is expected frame was 14 thousand years ago, when the depth of four meters allegedly living human skeleton 20 thousand years ago," he said. 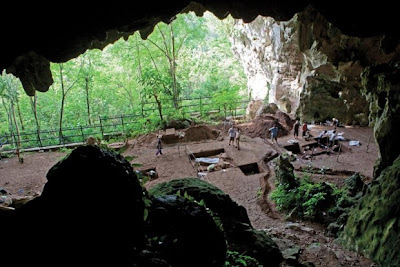 Head of Tourism of Ogan Komering Ulu, Aufa Sarkomi stated that DNA tests performed are expected to know the possible relationship ancient human skeletons and modern times today. He said that so far have found as many as 78 human skeletons of two different races, ie the Austronesian and Austromelanesid. Subsequently, the next steps for making the teeth test and carbolic acid in the soil is one way to facilitate the research of human skeleton ages," he said. 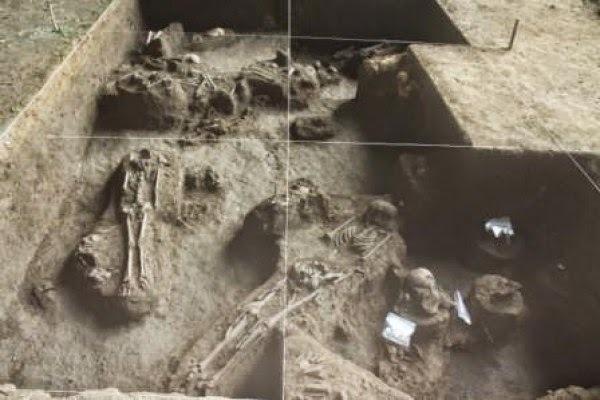 Among the human skeleton that discovered by the Jakarta National Archaeological team alleged skeletons of the mother and child were buried in the same hole. "It's very attractive and has a very touching story because the position of the mother skeleton was holding his child on her stomach," said Prof Truman simanjuntak and accompanied by the Head of Tourism Ogan Komering Ulu (OKU), Aufa Sarkomi in Gua Harimau, Baturaja on Tuesday, May 27, 2014.